In twenty years, Fiber will be one of Google’s most valuable assets. Fiber is a genius long-term strategic play. With Fiber, Google has 2 primary objectives: 1) Billionaire celebrity investor Warren Buffet explains the first reason most eloquently: “In business, I look for economic castles protected by unbreachable moats”. Fiber is a moat-widening endeavor. 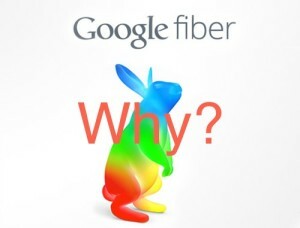 2) Fiber is a means to Google’s vision of the future of computing. This post will focus on the former. Apple, Google, Facebook, and Amazon are striving to be the super-mega technology company that owns every layer of the value chain. Google’s vision is the most ambitious of its peers. To understand that assertion, let’s observe how and when Google encroached on each layer of the technology value chain required to access any web service. 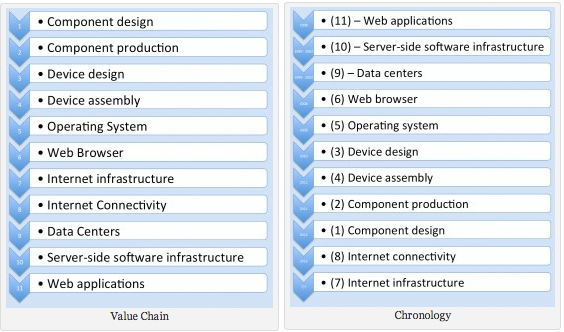 The following graphics illustrate the value chain, and Google’s systematic march down the value chain. The list on the left enumerates the fundamental pieces of the value chain, and the list on the right show how Google has moved down the value chain. This is by no means an exhaustive list, but provides enough detail to illuminate Google’s long-term strategy. Component design – computers need computer chips in order to compute, and computer chips have to be designed by someone. So do batteries, cases, cameras, and many other components. Component production – someone needs to manufacture all of those components. Device design – all of the major computing components – CPU, RAM, connectivity, display, battery, etc. – need to be enclosed into a coherently designed device. Device assembly – more than 1B cellphones are sold every year. It only takes a few million Chinese laborers and a few hundred factories to assemble them. Operating system (OS) – computers need an OS to provide a user interface. Internet infrastructure (switches, routers, cables, cell towers, etc.) – every piece of data on the Internet is routed through dozens if not hundreds of check points. Someone needs to manufacture all of this hardware and network infrastructure to connect everything. Internet connectivity (the ISP layer) – someone needs to pay for, deploy, and manage all of that Internet infrastructure. Data centers – there need to be computers on the other end of the pipe to do all of that computing. Server-side software infrastructure – virtually all modern web applications rely on virtualization, scaling, load-balancing, and database technologies, among many others. Web applications – and finally, at the very end of the value chain are the web applications that people actually connect to, such as Search, Gmail, Maps, etc. Google started at the very end of the value chain: search. Search is just another web application. Once Larry and Sergey developed search’s secret sauce, PageRank, they backwards-integrated into server-side software technologies to power and scale search. Although Google doesn’t create every piece of server-side infrastructure that it needs, it has developed quite a few. As Google grew, so did its data centers that powered search. Those same data centers would later power the rest of Google’s services. Data centers are a strategic layer of the value chain: data center efficiencies and deployments are some of Google’s key competitive advantages and trade secrets. It’s extremely difficult to setup and operate data centers at Google scale. Google developed extremely sophisticated expertise in the final three layers of the value chain before their IPO in 2004. Since then, Google has consistently encroached on the first half of the value chain. The first half of the value chain is far more capital-intensive, so they weren’t able to move into those layers until the company grew and matured. Google understands that it relies on hundreds of other companies that come before it in the value chain to deliver users to Google’s services. Google doesn’t want to allow anybody before itself in the chain to divert users away from the immensely profitable Google-verse at the end of the value chain. Google recognized the enormous costs and scaling issues involved in providing Internet connectivity to the masses, and in manufacturing and distributing routers and hardware backbone of the Internet to the world. So they skipped over those steps of the value chain, and purchased Android in 2005 (launched in 2008) to backwards integrate to the OS layer. It’s not publicly known exactly when Google began developing Chrome and Chromium, but it must have been late 2006 or early 2007 since Chrome launched in September 2008. In October 2011, Google purchased Motorola, which has business units dispersed through the first four layers of the value chain: component design, component production, device design, and device production. At the time of acquisition, the press primarily asserted that Google bought Motorola to help protect Android’s legal intellectual property in court. Although it wasn’t discussed very much in the media, vertical integration was a major motivator. Additionally, Google began dabbling in hardware design with the smartphone Nexus line in January 2010, and has since expanded into tablets, laptops, and Glasses. The hardware teams at Google are growing quickly. Although Apple designs a few of its key components – namely CPUs and batteries – they don’t own or operate a single factory or assembly facility. The hardware production industry is capital and labor intensive, complicated, and faces significant human rights, regulatory, and seasonality risks. With the purchase of Motorola, Google entered both layers of the value chain that require owning and operating a factory. Google is the only member of the gang of four to move into the physical production layers of the value chain. Google skipped two layers: producing the hardware backbone of the Internet, and providing Internet service to the masses. It’s clear that the ISP layer is far more important than the Internet backbone itself layer. Routers don’t do anything to discriminate against Google or anyone else. But the ISPs that own and operate the routers might. ISP executives have publicly spoken about violating net neutrality. For the uninitiated, the Internet has historically operated per the principle of net neutrality: ISPs treat all data the same. Violating net neutrality would be analogous to installing Internet toll roads. ISPs can discriminate and collect royalties by installing toll roads on the highways to access specific websites, including Google. Google is concerned that ISPs may begin to price discriminate between websites, allowing ISPs to charge users at different rates for different web services. Just imagine if ISPs imposed a cost of $.02 per Google search, and provided Yahoo for free. Google would be in peril. ISPs are already throttling YouTube because video consumes so much bandwidth. In a world without net neutrality, the ISPs will gouge Google. Google wants to undercut the ISPs before they undercut Google. It’s absolutely brilliant that Google is backwards integrating to provide Internet connectivity. Not only are they running a profitable business, they’re creating an enormous amount of good press for themselves, lighting a fire under the ISPs to increase their speeds, and acting strategically to protect their spectacularly profitable web-application services. There’s a 2nd strategic reason to integrate to the ISP layer: super-fast Internet connectivity will power Google’s vision of the future of computing, in which we approach 100% computing in the cloud. In order for this vision to pan out, connectivity needs to be so fast that people can’t tell the difference between native and web applications. When connectivity is fast enough, it doesn’t matter which end of the pipe computes. More to come on this in part 2. Kyle is Founder and CEO of Pristine, a startup in Austin, Texas developing apps for surgery and anesthesiology on Google Glass. He writes for HIStalk, an influential blog in healthcare IT, and TechZulu, a major technology blog. Before Pristine, he spent years developing, selling, and implementing electronic health records into hospitals. Outside of work, he's a bit of a fitness junkie. He runs, lifts weights, performs small-time gymnastics (rings), and plays ultimate frisbee. He's also a super nerd: a programmer, videogamer, and Rubik's Cube fanatic.